Up around 9:00 and out by 10:00. We took the metro to the Bird market Marche de Osieux and walked around. Poor little birds and bunnies on a nippy morning. Who has rabbit in an apartment in Paris? Maybe the same people who have a rooster? Back again to the metro (I’m getting good at navigating the system). Arrived at the Musee de la Louvre around noon went to the cafe and had brunch of quiche and salad. Hit the spot. Saw the top three sights. Winged Victory, Mona Lisa and the Venus de Milo (did not know it was Aphrodite??). Kristen wanted to see the Egyptian wing. We got lost in the wing and must have walked around in circles about three times. Our feet and my knee were getting tired of going up and down the stairs. After the Louvre we strolled through the Tuileries . What beautiful sunny day! At the end of the Tuileries on the Place de la Concorde was a ferris wheel (the Grande Roue). We decided it would be kind of fun to go for a ride. 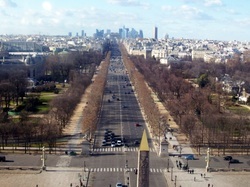 What great views of the Champs Elysees, Tour Eiffel, Louvre and Tuleries. Since we were right next to l’Orangerie, we went in. What nice museum,( tres petite after the Louvre). The Monets were beautiful, plus a fairly good amount of Renoirs and Picassos. Back to Cafe Republique for the Salade Fermerie. Still good! Lardons rule! Had our evening chat with Dave and off to bed. It was great to talk with him every night.